April is off and running at Grand Lake complete with a lot of showers to bring those May flowers. But don’t worry…the fish are biting and finally starting to settle down in more predictable spring patterns. Did you see the article in Sunday’s Tulsa World from Kelly Bostian? 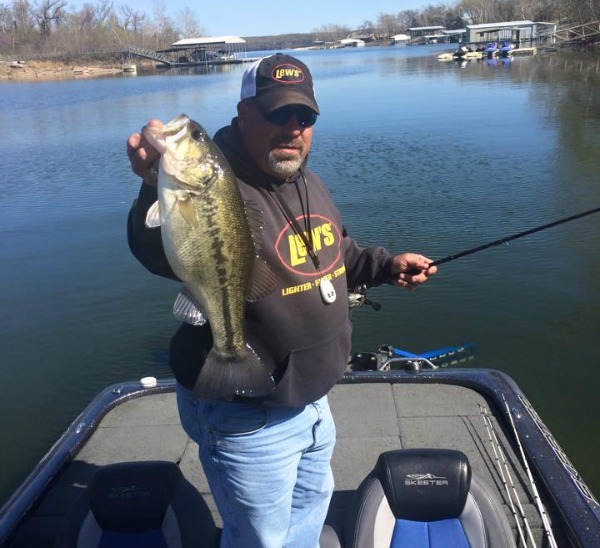 It featured our own Tony Coatney, and he talks about it in this week’s fishing report. What a week – the fishing has been really good, I mean the crappie fishing has been really good. Took out Kelly Bostian from the Tulsa World last Tuesday and that is usually a nightmare but not this time! Everything worked out great – the fish did everything I said they where doing and Kelly had a great article in the Sunday Tulsa World. Almost a full page in the sports section. You can see the article about the unusual crappie fishing HERE. Thank you, Kelly, and yes the crappie are still biting…the article tells it all. Large mouth has gotten good also. I am seeing a lot of beds but I haven’t seen them locked yet. But with the weather we are going to have this next week they should be locked on. I have been throwing [easyazon_link identifier=”B003CTV5JQ” locale=”US” tag=”myfamanc-20″]spinner baits[/easyazon_link] and [easyazon_link identifier=”B00ALM0E12″ locale=”US” tag=”myfamanc-20″]chatterbaits[/easyazon_link], also try a [easyazon_link identifier=”B00OW954EW” locale=”US” tag=”myfamanc-20″]senko[/easyazon_link]. White bass was good up the river but with all this water its all muddy now so try to find some clear water in the creeks. Catfish should be good with all the run off. Spoonbill have been really good in the river with all the inflow. We’ve been catching crappie.closer to the bank the last couple days. Maybe in 5-7 ft of water. Thanks for the reports! We are dedicated readers! !